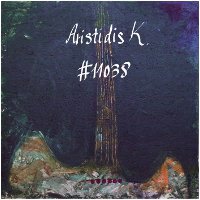 We are very proud to welcome yet another new member to our circle of artists, this time Greek guitar wizard Aristidis K. and his enigmatic debut release #11038. And enigmatic is the right word to use. This album is a compilation of deep thoughts and reflections of widely varying emotions aimed at taking the listener on a journey with "the guidance of sound as a sextant, enjoying the cool breeze while staring at the sunset". Indeed, Aristidis explicitly seeks to achieve 'methexis' with his audience, a Greek concept relating to participating, creating, and improvising in the action of a ritual. The goal of this evocative album is nothing less than an attempt to capture time with vibrations that distort the balance between flesh and spirit. The music itself is pure sonic landscaping with a six-string guitar, with some effects and other various instrumentation playing a supporting role, such as harmonica, slide guitar, percussion, paper clips, a cell phone, 60Hz hum, a carousel and various voice samples. The artist really shows off his compositional chops with this broad palette of tools, blending them all into an alchemical melange of tone poems that range from the experimental to the subdued, from the uplifting to the melancholy, all the while making it look effortless. There really is something for everybody in this release: the music is tonal and soothing while at the same time layered with enough abstraction and texture and grit to satisfy the most hardened experimentalist. A difficult balance to maintain, and one that Aristidis manages with aplomb. We are particularly struck by the uniqueness and clarity of his artistic voice; each piece stands firmly on its own, but there is a consistency and a creative thread that spans each track, making the album feel like a cohesive whole. To do so as he has done, without resorting to mere hooks or bland repetitions of themes, is in our opinion a great achievement indeed. So it is with great pleasure that we welcome Aristidis K. and celebrate the release of #11038. May it be the first of many such creations that we have the opportunity to share with our listeners. Thank you very much dxt!A.K. September 25, 2010 - Aristidis K.
Thank you very much for your comment! A.K. Very nice, thoughtful, playful tonal pieces. Quite good, rarely if ever overbearing. September 15, 2010 - Aristidis K.
Hello Richard!Thank you very much for listening to my release and for your comment! A.K. This is great stuff, it is playful and interesting to listen to. It has an organic, raw, and somewhat nostalgic sound.